Dr Robb Robinson is based at the Maritime Historical Studies Centre at the University of Hull and from a family which has been engaged in the business of seafaring for generations. He has contributed to many TV history programmes including: The Worst Jobs in History; The Real History Show; Inside Out, as well as Who Do You Think You Are? ; Find My Past; Great British Railway Journeys, the BBC 4 Sea Fever Series and Heston's Great British Food. During the last few years he worked on the BBC's 'Our Place in the Great War' project and participated in many Great War radio and TV programmes and took part in some of the BBC World War One at Home roadshows. He has contributed to the recent Channel 4's Time Crashers and Britain at Low Tide series. 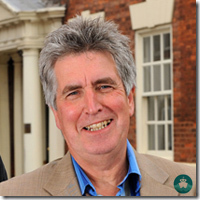 Robb is a Trustee of the British Commission for Maritime History and has spoken at many international conferences as well as at the British Academy, National Maritime Museum and the National Archives. He is the author of four books and numerous articles for publications which include The Oxford Encyclopaedia of Maritime History; Oxford Dictionary of National Biography, the Journal of Transport History, The Mariner�s Mirror; and The International Journal of Maritime History and Reviews in American History as well as a centre page piece for the BBC History Magazine. His book, 'Far Horizons' is a unique blend of global and local history containing biographies that encompass the world and are linked by the sea. His new book, 'Viola' is a twentieth century story of the North Sea and long Atlantic Ocean. He has also recently researched and written about some remarkable seventeenth century people from the English Civil War and Restoration eras. 7. The Mediterranean: its people and the Sea. 11. Far Horizons and Some Epic Stories of Sea and Land. 18. The World We Have Lost: how our ancestors lived in the eighteenth century.